Q: What is a haggis? A: An endangered Highland animal, according to one-third of the respondents to a survey conducted among 1000 U.S. visitors to Scotland. A full twenty-three percent said they had come to Scotland under the belief they could hunt and catch a haggis. One American tourist said he read that haggis is a birdlike creature that only comes out at night. Another claimed that the haggis is a fox-like mammal that sometimes ventures into cities. Ask a Scotsman what a haggis is and chances are you’ll get anything but a straight answer. Far be it from me to rain on anyone’s parade, but the time has come to set the record straight. A haggis is a small four-legged Scottish Highland creature. Its limbs on one side are shorter than on the other, meaning that it is perfectly adapted to run around the hills at a steady altitude. As the haggis always runs clockwise, he can be caught by running around the hill in the opposite direction, though the task is made easier if you sedate him by playing specific notes on your bagpipe while you run. The young, wild haggis is normally harmless, though when fully grown, he can become quite dangerous during rutting season. His primary evasive strategy is his ability to confuse: being both feathered and furry, the hunter never knows which feature is predominant. When he runs, he runs like a bird, and when he flies, he flies like an animal. At the present time, only kilted Highlanders can obtain official haggis hunting licenses, and haggis can only be hunted in season between November and January. Wild haggis, though originally native to Scotland, have been spotted in Nevada, the offspring of specimens introduced in the 19th century by a couple of Scottish immigrants. Haggis is actually a savoury dish made from the minced internal organs of a sheep, mixed with oatmeal, spices, salt, pepper and boiled in a sheep’s stomach (an early prototype for modern ‘boil in the bag’ meals). 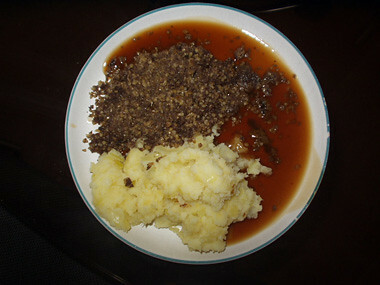 Haggis is normally served with mashed neeps (turnip) and mashed tatties (potatoes). Haggis is eaten all year round in Scotland, but has a special place in the Burns supper served on January 25th, when Scotland’s beloved poet, Robert Burns, is commemorated. Burns penned the poem Address to a Haggis, which begins “Fair fa’ your honest, sonsie face, Great chieftain o’ the puddin-race! Aboon them a’ ye tak your place….” In Burns’ days haggis was a popular dish for the poor, since it made use of parts of a sheep that would otherwise have been wasted. In more recent times, haggis has been found both in the fish and chip shop, deep-fried in batter, and dressed-up in various guises on fancy restaurant plates. Haggis counts among its many talents a starring role in the sport called Haggis Hurling, which involves throwing a haggis as far as possible. It is also the lovingly-portrayed subject of entire books. For people of squeamish dispositions but insatiable curiosity, vegetarian haggis is available – the point of which eludes me – which consists of everything minus the offal. I find it resembles bland falafel. For those of you who must have the real thing, you can either order it, or better yet, make it yourselves. Trim off any excess fat and sinew from the sheep’s intestine and, if present, discard the windpipe. Place in a large pan, cover with water and bring to the boil. Reduce the heat and simmer for an hour or possibly longer to ensure that they are all tender. Drain and cool. Finely chop the meat and combine in a large bowl with the suet, oatmeal, finely chopped onions, beef stock, salt, pepper, nutmeg and mace. Make sure the ingredients are mixed well. Stuff the meat and spices mixture into the stomach which should be over half full. Then press out the air and tie the open ends tightly with string. Make sure that you leave room for the mixture to expand or else it may burst while cooking. If it looks as though it may do that, prick with a sharp needle to reduce the pressure. Place in a pot and cover with water. Bring to the boil and immediately reduce the heat and simmer, covered, for three hours. Avoid boiling vigorously to avoid bursting the skin. Serve hot with “champit tatties and bashit neeps”. Dubh Prais Restaurant has a pan fried oatmeal-encrusted haggis starter, which is exceptionally tasty. Stac Polly is famous for their signature dish of phyllo-wrapped haggis parcels in plum and red wine sauce. I wants me some authentic haggis but for some reason I don’t think I’ll find any in Hollywood. Oh well. I can dream. Great article! Hi Eddie, I would offer to send you some from Scotland, but unfortunately the USDA prohibits the import of animal lungs, which are of course an *essential* ingredient in any decent haggis… Guess you’ll just have to plan a trip to Scotland! Between you and me, though, it’s not really worth wasting your dreams on ;)Hi Michele, coincidences seem to be the thing around here! Thanks for your compliments and I hope you have a wonderful time up here in Scotland – the weather seems to be improving, ever so slowly. Let me know if you’d like any more specific info! Oh my god. That’s HILARIOUS! My son lives in San Francisco and I want to have a Burns Supper there on 25th Jan 2006.Where in USA and particularly San Francisco can I purchase an authentice haggis? You have only told half of the story about the wee sleekit courin haggis beasties.There are in fact two distinct breeds of Haggis – those with shorter legs on the left side of their bodies who run around the hills in an anticlockwise direction and those with shorter legs on the right side of their bodies who run around the hills in a clockwise direction. Mother nature has deemed it such that these two breeds will never mate to thus compromise the purity of the two breads – since if the two were to meet they would only ever meet head on! I am a chef and I’m looking for inspiration for a new haggis starter on my new menu. You quote Suruchi as having the worlds’ only Haggis pakora. The Trust Inn in Kilbarchan has had Haggis pakora on it’s menu for 7 months . THANK YOU. You can order USDA approved haggis here:http://thescottishgrocer.com/haggisandstews.htmlI've had it and it is as good as any I’ve had in Scotland. It’s made with beef, beef liver, steel-cut oats, etc. They also have a lamb (and vegetarian) version.And for those of you looking for a presentation haggis for a Burns dinner, they sell one of those too.Great website, just found it! What is the gravy in the picture? Got to have a good gravy or sauce or it is naked. I would love to try it. Just like evey culture has their pancakes, crepes, or tortillas there are other things that are similar as well. So sausage made with leftover parts and some kind of starch to stretch it makes sense. Growing up in Texas and Louisiana there are lots of places with boudin (sausage made with rice and liver and pork). Which I love. I also have lived in Minnesota and there they had Swedish potato sausage made with beef, pork, and potatoes. The picture doesn’t include bashit neaps. The only gravy for haggis is neat whisky, generously applied. The liquid on the plate does not look like whisky. Haggis tastes better than it sounds. A bit. We were in Edinburgh 2 years ago with a tour, & were served Haggis as part of the plate in a "Burns Dinner", tho it was the middle of May. Because I grew up in a small German-Texas town, the local farmers all made homemade liver sausage & "blutwurst" (blood pudding to you UK folks) — so I had no qualms eating the haggis & enjoyed every bite. Had also eaten Cajun boudin, which is now in the local groceries. Unfortunately the local farmers no longer make the Blutwurst (that older generation has long ago died (;-( And I do miss it !! What the local butcher makes is nothing like the old stuff. I was pleasantly surprised to find blood pudding on the breakfast buffet on a number of UK hotels! !